Last week a discussion erupted on Microsoft forums regarding Azure AD Connect due to it’s Monitoring Agent using all free resources of CPU on the servers. These issues were caused by a .NET Framework update and a lot of administrators spent time uninstalling and blocking these patches to resolve the CPU usage issues on their servers. On Saturday Microsoft released an update (KB4340558) which contains a collection of several patches where one of the earlier mentioned .NET Framework updates were included. For more information, see this link. In version 1.1.105.0 of Azure AD Connect, Microsoft introduced Auto Upgrade. Although, not all updates are published for Automatic Upgrade. Whether a version is eligible for automatic download and installation will be announced on Microsofts version-history website for Azure AD Connect. You can verify whether your Azure AD Connect installation have Auto Upgrade enabled by either using Powershell or viewing your configuration in It’s GUI. PowerShell-command for determining whether Auto Upgrade is enabled or not. This command will return either Enabled, Disabled or Suspended, where as the Suspended state only can be set by the system itself. 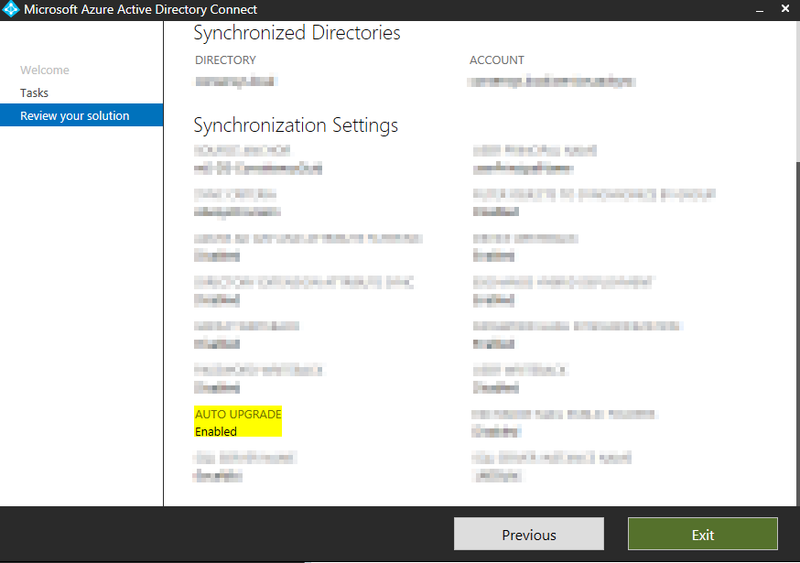 Newer installations of Azure AD Connect enables Auto Upgrade by default, in case your installation applies to Microsoft’s recommendations. For more information, see this link. 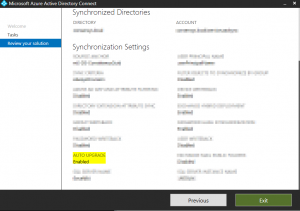 In case you have an installation of Azure AD Connect older than 1.1.105.0 (February 2016), Auto Upgrade will be disabled, if you’ve not enabled it manually. Enabling this function can be done with below PowerShell-command if so wanted. Working with backups of your virtual machines is obviously essential. Working with exports in XenServer can some times be time consuming, particularly with bigger virtual disks attached to your virtual machine. In this scenario I will show you an alternative to manually export via XenCenter, by doing it with Powershell to an remote server using XenServer Powershell module. It’s finally here – the preview of Windows Server 2019! Windows has release the first preview of the completely new Windows Server 2019. 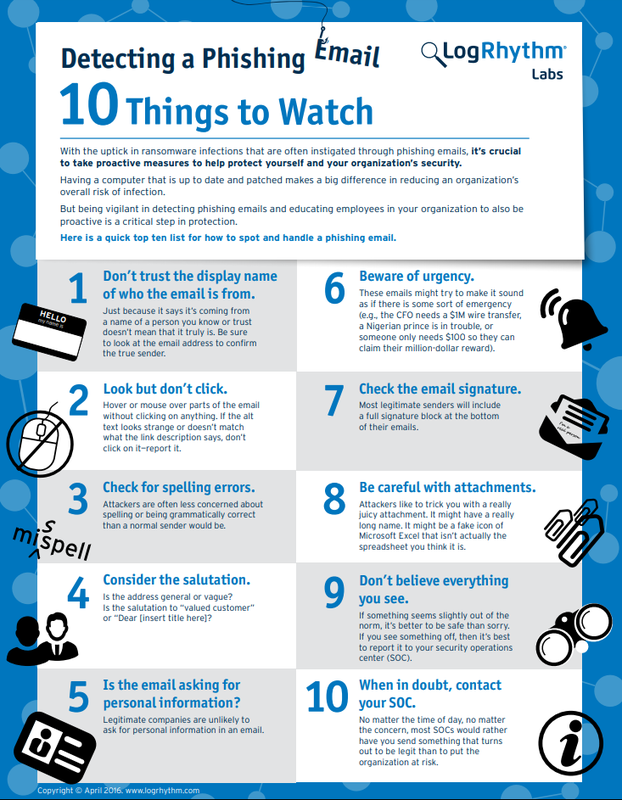 In this article I will summarize the main news and tell you a little about them. The final version of Windows Server 2019 are planned to be released in the second half of the calendar year 2018. Windows Server 2019 will come with the previously announced Project Honolulu (which is a modern server management interface). This will help you to more easily integrate Azure services (like Azure Backup, Azure File Sync disaster recovery) so you can use these services in a more convenient way. Shielded VMs was first introduced in Windows Server 2016 and was only available for Windows Server. In Windows Server 2019, support are added for Shielded VMs for Linux. VMConnect will be improved for troubleshooting of Shielded VMs for both Windows Server and Linux. Another new feature is called Encrypted Networks which will let admins encrypt network segments to protect the network layer between servers. Microsoft is also embedding Windows Defender Advanced Threat Protection (ATP) feature in the operating system which provides preventative protection, detects attacks and zero-day exploits. Microsofts Goal is to reduce the Server Core base container image to a third if its current size of 5 GB. That will reduce the download time for an image by up to 72 % which will be a significant performance boost. Also, in Windows Server 2019 the choices available when it comes to orchestrating Windows Server container deployments are event better. Another new feature is the ability to run Linux containers side-by-side with Windows containers on a Windows Server. Windows Server 2019 are adding adding scale, performance and reliability to HCI environments. With Project Honolulu (mentioned above) you will have the ability to manage HCI deployments which are a great new feature. This will help you simplify the management and day-to-day activities on HCI environments. Read more about the preview here. Det finns många sätt att flytta Hyper-V VM till Azure, i detta fallet beskriver jag hur det kan göras till ett befintligt virtual network (classic / Azure Service Management – ASM). $sourcedir = "D:\VMs\VM\Virtual Hard Drives"
Innan ett VM flyttas från Hyper-V till Azure behöver det bekräftas att Remote Desktop är aktiverat samt att det är tillåtet i brandväggen för Domain, Public och Private networks. # Användarnamn och lösenord som är admin för din Azure-subscription $cred = Get-Credential Add-AzureAccount -Credential $cred # Ta hem certifikatet som används för att autentisera mot Azure Service Management # Kommer öppna Internet Explorer för att ladda ner certifikatet Get-AzurePublishSettingsFile # Använd certifikatet Import-AzurePublishSettingsFile "<PATH>\<SUBSCRIPTION>-credentials.publishsettings" # Lista de subscriptions du har åtkomst till Get-AzureSubscription # Välj din subscription Select-AzureSubscription -SubscriptionName "<Subscription Name>" # Välj subscription och vilket storage account som skall användas Set-AzureSubscription -SubscriptionName "<subscription>" -CurrentStorageAccount "<storage account>"
Set-AzureSubscription -SubscriptionName "<subscription>" -CurrentStorageAccount "<storage account>"
# Från CMD som admin set devmgr_show_nonpresent_devices=1 start devmgmt.msc View > Show hidden devices Avinstallera network adapters som är "hidden"
Avinstallera network adapters som är "hidden"
Har du något mer du gör när du flyttar VM till Azure? Lämna gärna en kommentar!